Hello everybody! Long time, no speak. Life is a bit busy at the moment, and by 'bit' I mean horrifically. Two 5000-word essays due after Easter, a dissertation proposal to write, and two part-time jobs to wrestle with. Yes, this is an excuse for a lack of posts, but I am still reading, I am still loving the books, and I will be writing some reviews as soon as hand-ins are done! Reading: Wild by Cheryl Strayed. Absolutely beautiful and incredibly inspiring. Listening: Girls in Peacetime Want to Dance by Belle & Sebastian. Hello Internet podcast release days are also always the best days. Watching: Season 3 of House of Cards, very very slowly. My schedule isn't really allowing a binge watch, unfortunately! Eating: Sharer bags of cheesy Doritos. I am ashamed. As soon as Easter is over and my essays are in, from then until September will purely be dedicated to my MA dissertation (hints on the topic in the photo above!). Spooky, huh? I swear I've only just started this course and now the end is technically in sight. Despite knowing what happens in this book thanks to the internet and a lack of spoiler tags, this absolutely blew me away. I hate to use the phrase 'page-turner' but Gone Girl really was a page-turner, completely subverting any preconceived ideas of the 'missing person' thriller.The characters of Amy and Nick are beautifully twisted and unlike anything I've read before. Flynn's writing is much smarter than I imagined, with seemingly unimportant points becoming incredibly important later in the book, showing a lot about her deeply intricate planning for this novel. At points I really did find myself shocked by how well things pieced together. I've seen this book mentioned around the book blogging world a lot since Jean reviewed it on her channel Bookish Thoughts, giving it very high praise and exclaiming her love for Wyndham after reading this sci-fi classic. After reading it myself I can completely see why. For a book written over 50 years ago, the fear it provokes in the reader is still there, with the eerie image of nearly eleven-foot plants walking across fields sending shivers up my spine. Wyndham does a brilliant job of describing the society of the time, the events that led to the Triffids arriving on Earth, their spread and the eventual downfall of inner city life. Upon finishing the book I found nothing that was unanswered, with an entire timeline of events being very clear in my mind. I found the investigation into the Triffids themselves hugely fascinating and almost too believable. Along with the references to the search for oil and satellite weaponry, the entire story felt completely viable. Arguably one of the most popular young adult series' of our time, the Divergent trilogy was something I'd never delved into or really felt interested in delving into. I'd heard too many people saying it was just like The Hunger Games but after finishing the first installment of the series I can definitely say those people aren't to be listened to. Sure, I can see some tiny similarities, but there's a whole different world created by Roth here that drew me in from the first page. I felt the characters were built so well, as was the world in which they loved. The idea of the factions and the society that surrounds them fascinates me and I'm really excited to see how the story develops later in the series. I started reading Insurgent a little while ago and I'm already loving it. P.S. I hated the Divergent film. I thought they removed all of the character building the novel did so well, leaving them pretty empty in the adaptation. Where do I begin? This may have been the most beautiful graphic novel I've ever read. I've been a fan of Scott McCloud for a while now so when I heard his first graphic novel in nearly ten years was coming out, I knew I needed a copy. His art style is stunning despite only being in white with shades of blue. The story of The Sculptor follows a young, uninspired artist who is at an incredibly low point in his life. When met in a café by the ghost of his dead uncle, he makes a deal with him, gaining the ability to form anything he imagines in his mind with his hands in any material he desires. The catch is that in 200 days he must die. Then along comes the girl of his dreams. Perfect timing, right? This story is heartbreaking but so, so beautiful. I read all 500+ pages in under a day. 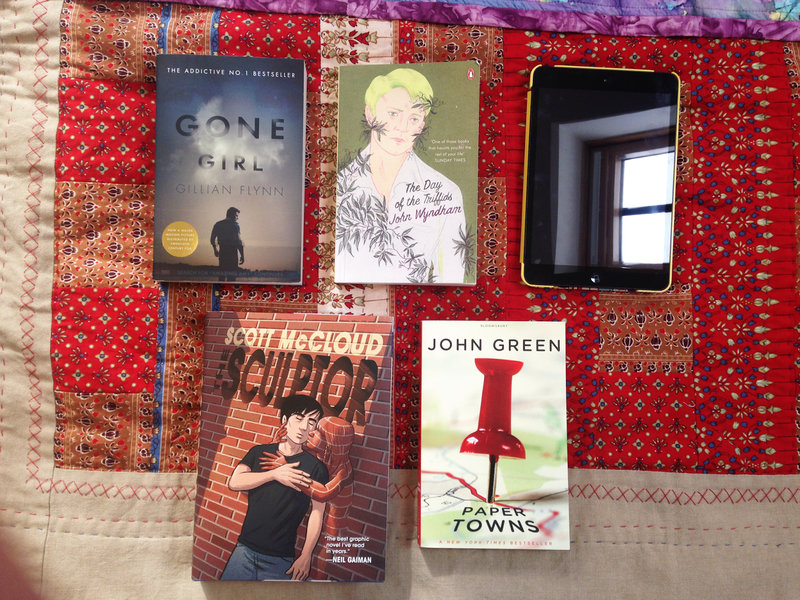 I planned on reading Paper Towns this year in preparation for the film coming out in June. Honestly, I got three chapters into this book and couldn't take it any further. I was a fan of Looking for Alaska and managed to make my way through The Fault in Our Stars, but I just couldn't stomach Paper Towns. There's only so many quirky teen characters I can handle with oddly philosophical thoughts and slang I can't imagine anyone saying. Although I know many people find John Green's works accessible for any age, I felt so out of touch with this world he created and the people who inhabited it. No longer wasting my time reading books I'm not enjoying, I put this one down. Good morning, March! February is a funny short one, isn't it? I didn't manage to beat my 7 books read in January, only reading another 7 in February, but I'm not too bothered about that. I don't have any excuse to give you! I reviewed: No One Belongs Here More Than You. I finally beat my MA reading list this term, leaving me with free reign after I finished Miranda July's collection to read whatever my heart wanted. 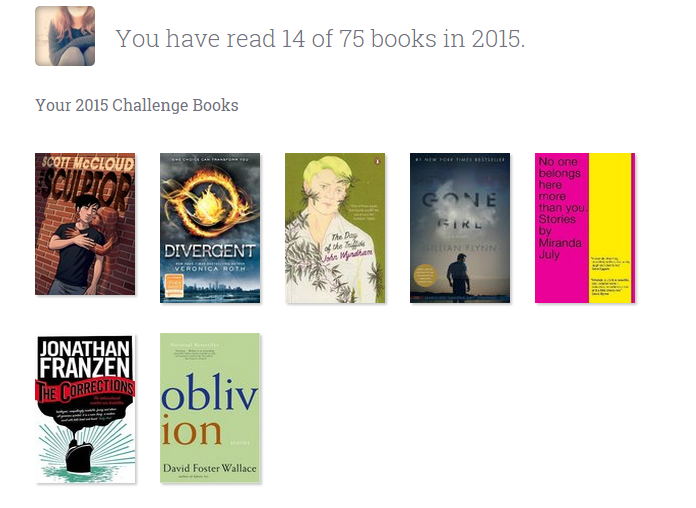 It's been an amazing feeling and I'm struggling to pick what to read next each time from my huge TBR list! I'm planning on finishing the Divergent trilogy this month, maybe starting to reread the Series of Unfortunate Events series as I read them when I was younger but never finished them all! I'd also like to get back onto the graphic novel bandwagon as I've been so bad with that recently. 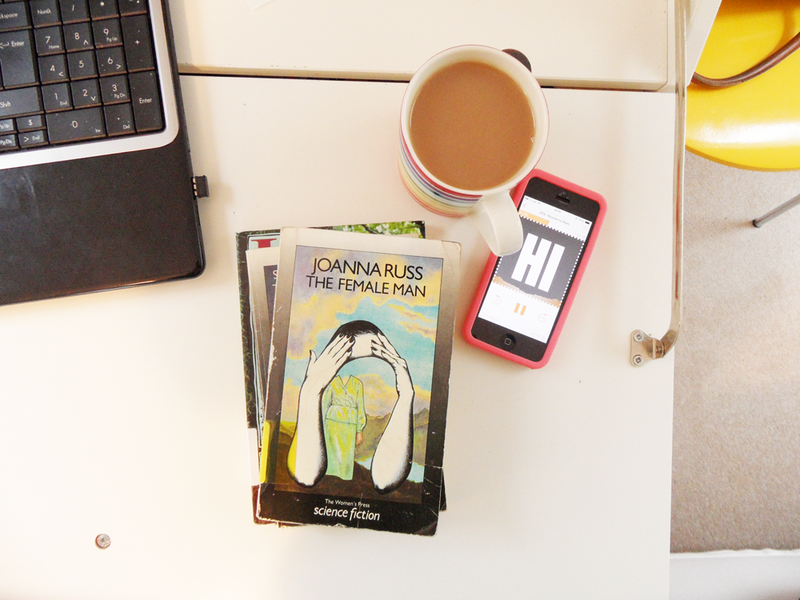 What have you been reading this month that you absolutely love?